NOTE: This is an old review and my thoughts have changed somewhat. May revisit after a rewatch. Online I’m surrounded by a fairly healthy community not only with diverse tastes in Anime but diverse tastes in general. Despite that, mainstream Anime always seems to be a trigger for some of them. Kill la Kill initially proved to be somewhat of an exception, but returning after several weeks of absence I heard a different tune. One night just as I was going to bed I started getting notifications from a chat I was in with a number of these people, and they were talking about Kill la Kill. All the people I had seen speak positively were now speaking negatively with extreme aggression. It bothered me because it felt so overblown, so rather than sit on the outside like I did when people were complaining about other more mainstream shows as they were airing, I decided to see what it was all about and got back in to the series. I found myself a bit puzzled by the nature of Kill la Kill upon getting back into it. I wasn’t sure whether it had lost its mind or whether it was all just one big joke. I eventually leaned towards the latter, but in a more meaningful way than simply appreciating the humour. I viewed it as fundamentally perfect parody, partly perfect for grounding itself in a few of the basics and partly absurd for its context. What came next was figuring out what exactly it was parodying. I leaned towards battle shonen parody because its essence was that of a battle shonen, not to mention I viewed certain aspects like the minute and a half recap episode and Mako’s interruption of Ryuuko’s angst-driven ramblings early on in the second part as light-hearted stabs at battle Shonen clichés, but what about the lewdness of the series? What about the basic story and character clichés that aren’t particularly present in battle Shonens? It was too broad for me to really make a concise judgment of what it was parodying, but upon finding an Anime analyst by the name of Bobduh just days before the finale and reading an article he wrote on the second to last episode (article right here:http://wrongeverytime.com/2014/03/24/kill-la-kill-episode-23/), I came to the realisation that Kill la Kill was a parody of fanservice in general. Not just in terms of sexual fanservice, but the general idea of appealing to the audience with things that provoke simple compelled reactions. It shamelessly covers the entire spectrum of fanservice clichés with an amusingly tongue-in-cheek mentality. Being so tongue-in-cheek, Mako is the one problem I find with the series as, quite frankly, she just isn’t funny most of the time. That’s not to say she’s annoying, though. She does in fact hold a pretty decent role as a character in a parody series in that she foils all attempts the series makes to take itself too seriously. Many people are critical of its animation inconsistencies but I couldn’t even will myself to be critical of it. At first it was simply because I accepted it as parody because of the deliberate fluctuance in quality, but much more than that I realised, in the grand scheme of things, it didn’t really mean anything to me. I was way too swept up in the broken illusion of fiction and the sheer density of things happening to even consider it. Kill la Kill isn’t going to be too fun if you look to its fundamentals more than you do the sum of its parts. Hell, if you critique anything by just picking on the basics of story, characters and animation your interpretation is going to be incredibly shallow and jaded, but Kill la Kill in particular has such bizarre execution that it deserves a different perspective. It doesn’t give Kill la Kill enough credit to simply call it style over substance, it’s literally pure concentrated style. For that reason to get swept up in the series is rarely to get swept up in its matter but rather the feeling it gives to see so many strange things play out and generally just to see, well, lots of big things happening. I’m caught somewhere between complex and simplistic when I analyse Kill la Kill, but the series brings out that desire in me not only to be blown away by the essence of its face value but to really appreciate how and why that face value gets me. The final two episodes of the series captured me in that way most of all, and so in finishing the series I’m left with a very positive impression. The best way to sum up Kill la Kill is that it’s an anomaly. It’s such a simple series at its core but it says so much about the beast of fanservice Anime has become by using so many aspects of it to essentially build a series from the ground up. Not only is it a damn near unstoppable candidate for my 2014 Anime of the Year, but also a new series to sit proudly among my all-time favourites. It’s dense, it’s fun, it’s stylish, it’s amusing. 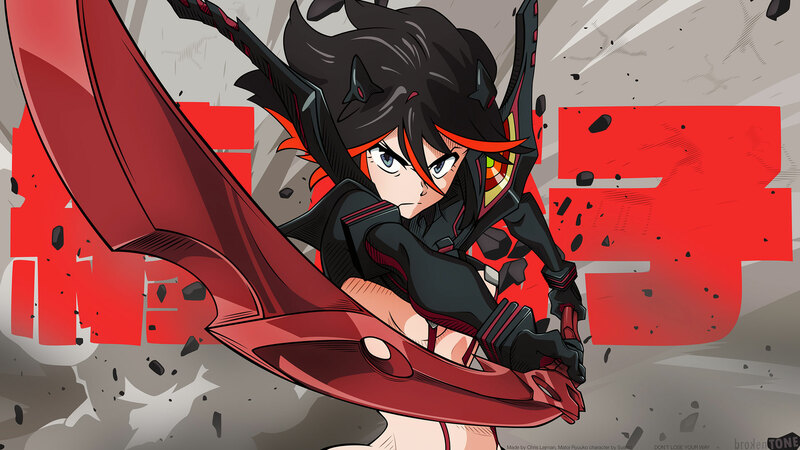 Kill la Kill is a wild and effervescent beast of a series with so little yet so much.